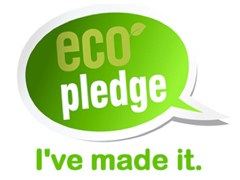 An Eco-pledge campaign is a nice idea you can run with schools, clubs, or community groups. An Eco-pledge is one positive environmental action or behaviour you promise to do, that will make a contribution to helping protect the environment and reduce use of the world’s finite resources. An Eco-pledge can be on any topic, whether it be relating to waste, energy, water or transport. Examples of an Eco-pledge could include: “I pledge to leave the car at home for short journeys” to “I pledge to make a shopping list and stick to it” or “I pledge to take a shower instead of a bath to save water”. A very successful Eco-pledge campaign was launched by the Regional Waste Management Office (RWMO) for Limerick Clare Kerry, aimed in particular at schools and community groups. Click here to see the examples undertaken by the RWMO.